Who ever said the only acceptable way to consume God’s Word is actually opening the hard copy of the printed Bible? No one did, that’s who. But God does want us to get a daily dose of His Word. Reading scripture is food to our soul! Our physical bodies need to consume food daily or we grow weak, and we could even starve to death. As important as food is to our physical existence, it’s equally important to our spiritual existence. I don’t always have time to sit at a gourmet restaurant; sometimes I make a sandwich. What’s important is that I get food regularly!! Don’t misunderstand me. I love to sit down with the printed Bible and really take my time to read and study it. It’s my personal preference: always has been. I feel so alive afterwards and uplifted. But guess what, I don’t always have time for that. I am hesitant to admit that I went through a period of time when I actually felt guilty if I didn’t have the time….I actually felt like I was failing in my duty to read God’s Word…like I was a big ‘let down’, a failure, a hypocrite. But guess what? God never did feel that way about me. No sir, God relieved me of that burden one day with this simple statement, “it doesn’t matter where you read The Word, as long as you read The Word.” In other words, it doesn’t have to be the published and printed hard copy. I can soak in God’s Word by listening to scripture readings on CD or the radio. I can read my daily scripture sent to my iPhone. I can read a few scriptures in an email devotion. I can even read my own handwritten scriptures on a chalk board in my home. 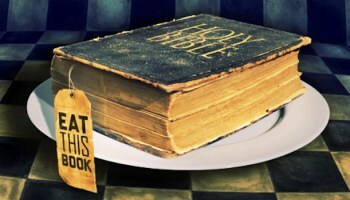 Printed, digital, audio or handwritten…..it doesn’t matter as long as we are consuming God’s Word!!! In this age of advanced technology, we are without excuse. God’s Word is so easily and readily available to us at the touch of our fingertips or at the command of our voice. So when you don’t have time to sit in a restaurant, it’s okay to make a sandwich.